Gründet 1972, diese funky britische Prog-Band mit John Turnbull (Gitarre, Gesang), Graham Maitland (Keyboards, Gesang), Norman Watt-Roy (Bass, Gesang) und Stewart Francis (Schlagzeug, Gesang). Gemeinsam spielten sie in Skip Buffet Greatest Show. Auf der Erde, Forever Mote und einige andere angesehene Taten, und ihre Pedigree glänzt bei diesem Klassiker-Debüt. 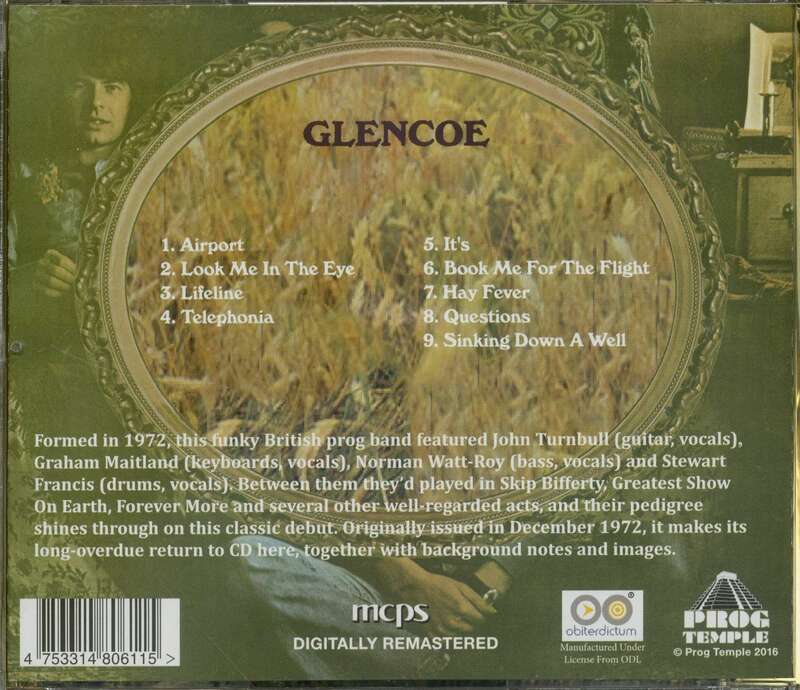 'With a five-week American tour under their belt, Glencoe returned to the home boards with a gig at London's Marquee Club on Monday, February 19th. In their absence, the grapevine had been well and truly at work, and fellow musicians turned out in force to welcome home the four-piece, who've already developed their own cult following. Rory Gallagher made the gig, probably with memories of how his former band, Taste, took off along the same route some years ago. Also there in the audience were Wishbone's Martin Turner, a couple of members of Average White Band, and none other than retired guitarist Peter Green. 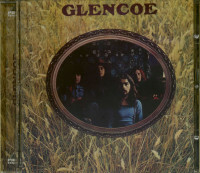 Before Glencoe left for their first tour of the States, the band were being touted to become one of Britain's more exciting rock acts. And the praise sustained through the American tour. 'The best out-of-nowhere warm-up act to play Chicago fh 1972, and probably 1973' is how the Chicago Sun critic reacted to the band following a gig in the city supporting Steve Miller and Roxy Music. Other critics commented how, during the band's stage work, they manage"to generate an atmosphere of a much larger unit. The American critics' summing up isn't hokum either; rather their comments hit the nail dead centre. One of the band's finest gigs last year was played at the dire Buxton Festival, when they had the unenviable task of coming on first and warming up a cold, dishevelled audience way up high on,a bleak Derbyshire hillside. 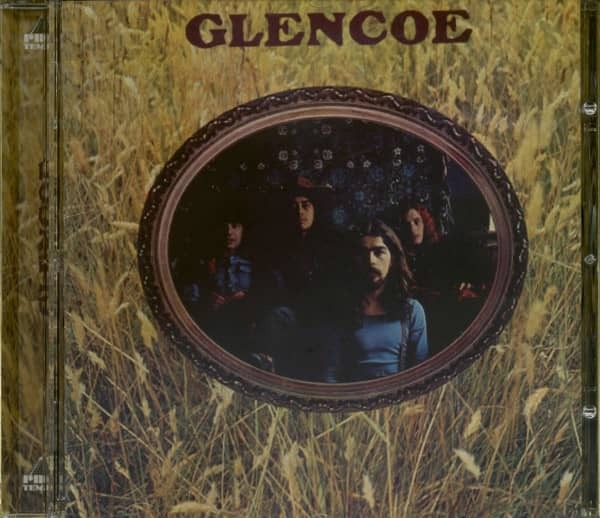 It was my first experience of Glencoe, and it was exactly like the Chicago Sun writer explained - somethipg so good, funky and racing coming from out-of-nowhere. AboveAll they came on like a band who had the confidence of theft own 4eas, weren t afraid,to extend a musical idea when the action was runnineAnd they had the ability to put a smile on even the most wind-torn face. But above everything else, the group themselves - even though a warm-up act - treated the set as an important event and made everyone at that festival feel the same way. Anyway, that is part of the group's overall outlook - to set something rolling between them and their audience. Guitarist John Turnbull recalled their set at Buxton when we spoke at CBS record company offices. "Yes, that was a really great gig for us," he said The adrenalin was running for us all day after that. We were fitted into the bill almost at the last moment, and had to go on first. The audience seemed to be with us and the feedback was fantastic. I can remember us saying: 'Look, you've • -10'4 got it in your hands, all you've got 4"- 1 to do is take it.' It was a really warm vibe we got back. We had to leave almost immediately after the set and then we dove on to the next gig with a real natiural high, then just rushed onstake anittstarted it ll moving aga41. Thaes,vxactly the way it should be. Great!" Before jointing Glencoe, Turnbull was with a Scots group called Forever More, and more recently with Arc. The other members of the band - we have a long and complicated history of playing together in various band in Scotland - are keyboard man Graham Maitland, drummer Stewart Francis, and Norman Watt-Roy, on second guitar. Their first album, entitled Glencoe, was released just prior to Christmas. It wasn't,entirely successful; neither did it capture the full rush of their live performance or enhance their work through the studio to any great degree. Turnbull agreed that maybe, for a first album, the group were a little over- ambitious in producing, arranging and working out the entire concept of the album themselves. Next time they will be working with a producer. "The first album was all right," he went on. "But not everything worked out Like you say, we didn't utilise the studio as much as we should have Now we are all looking forward to recording the next."